In this season of chocolates and candy hearts, we wondered: how, and when, did the heart become associated with romance in Western culture? The early Egyptians believed the heart was the seat of the soul; the Greeks, the seat of both reason and emotion. It’s not an unlikely association, but there does not seem to be an absolute source for it. 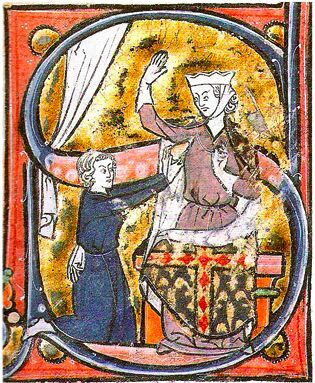 The first known depiction of heart = love, from Roman de la poire (ca. 1250), shows a suitor handing his anatomically correct heart to the object of affections, who looks somewhat taken aback. Within only a few years the heart symbol had become more decorative and less anatomical, and firmly associated with devotion, both romantic and religious. 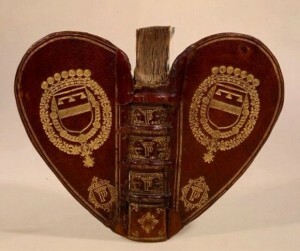 It’s not surprising, then, that bookbinders have been drawn to the heart shape in creating books. Medieval heart-shaped books were generally composed of hand-lettered and illuminated folios stitched together. In many cases the unopened book resembled an almond. When the book is opened it blossoms, so to speak, into a heart. 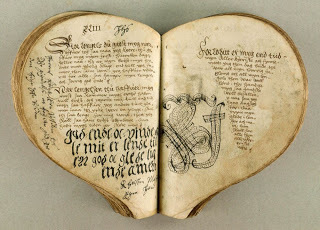 “The Heart Book,” left, dates from the 1550s. It is the oldest known Danish collection of ballads, and contains 83 love songs from the court of King Christian III. (1) In fact, heart-shaped books seem to fall into two categories: books of music, and devotional books. The point of the heart is gently rounded on the binding, but the pages themselves are squared off, and the writing in the book seems only slightly to reflect the shape of the book itself. The Book of Hours of Amiens Nicolas Blairie, below, when opened, makes a more classic heart shape. 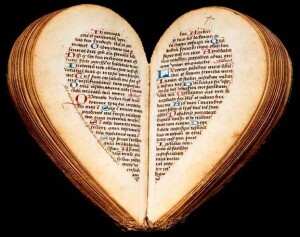 The shape was such that, opened, “the two halves of the almond bloom to fit the contours of a heart, concrete evocation of the heart of the person praying the prayer that opens.” (2) Unlike the Heart Book, the lettering in this Book of Hours closely mimics the shape of the book and creates a heart of its own. The impact of the illustration and lettering in these books can’t take away from the accomplishment of the binding: opened, the heart shape morphs into a butterfly. The binding itself is covered with deep red velvet. 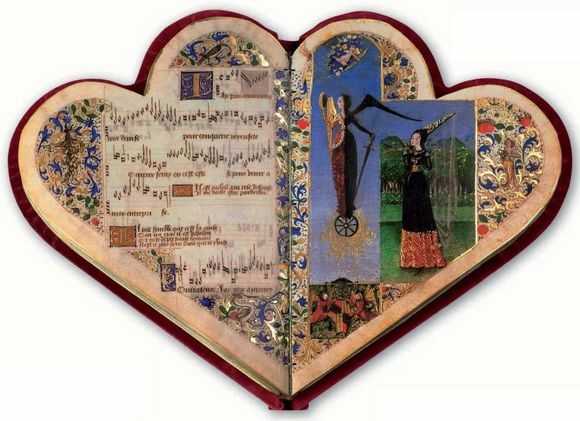 Creating a cordiform (heart-shaped) book poses some particular challenges for the modern bookbinder. We rarely hand-letter on folios, and printed text on rectangular sheets folded into signatures is unlikely to work: how would one trim the text block into the desired shape with traditional tools? One modern hand-bookbinder considering creating a heart-shaped book using a press and plow or guillotine finally came to the conclusion that the idea was trickier than she had at first thought. She hasn’t given up the idea, but we have no update as how how she fared.